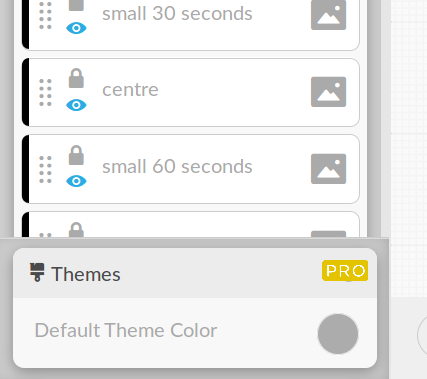 Currently unable to access right-click menu (for last/second-last layer), or background colour dialog .. These are blocked by non-working NEW 'Themes' dialog box, which can NOT be banished or moved. Clicking on opens full screen dialog ('Coming Soon', have credit card ready ..), and closing that reverts to initial state. This is likely not an issue for any design with less than (estimate only) 14-15 layers. As you could scale down page to work around. I've seen something like this before. Just to confirm, when you have a lot of layers is there a scrollbar to the right of the layers? But the scroll bar does NOT effect this dialog box. snapshot, bottom-right corner of screen ..
Yep, I've mentioned it before. As a temporary workaround you can use the scroll button on the mouse, but that's something you shouldn't have to do. In the old days, you could set things up with frames so it didn't happen, but I'm not sure what's used these days as it's been phased out. Hey guys - fix for this should be coming tomorrow or Wednesday. Thanks for the report and your patience!